Day 4 was one of the most anticipated days of our trip. If we had been able to stick with our original SOBO permit we would have started at Yosemite and finished with Mt. Whitney and exited the trail at Whitney Portal, but because we had to switch to NOBO last minute due to the fires it was the first mountain we would have to climb, and the biggest. I was a little nervous to start the trail with the highest peak of our entire trip, but because we started 25 miles ahead at Cottonwood Pass that gave us a few warm up days before hitting our first mountain. Since we were coming from the trail and not from the Portal, we’d be going up the mountain and then back down from where we came instead up going up one side and down the other. This meant we were able to leave our tent and packs at the base of the mountain and climb with only the necessities: water, food, and headlamps. Knowing I wouldn’t have to wear a pack made me feel light in heart and on my feet. Our alarm was set for 4am, but even before that we heard several groups of campers hike past our tent in the early hours of the morning as early as 1 or 2am. Even though it was dark when we woke up, I felt like we were late risers compared to all the other hikers that had passed us. I ate a meal bar and some energy gummies that our friends had given us the day before hoping it would give me the boost I needed to start the day. As soon as we started up the mountain, I began to feel sharp, gas pain in my stomach similar to the pain I had felt the day before, only this time it was worse. I realized it must be the gummies that had been gifted to us because I’d been eating meal bars for days without any problems, and my stomach pain from yesterday was also after devouring several gummies. I was sad that I wouldn’t be able to eat any more of my new delicious trail “candy” and also angry that I was having to climb the biggest peak on the JMT with terrible stomach pain. Logan didn’t have any problems with the gummies and was doing fine, but he was worried I might be like this for the whole climb. At first, the knot in my stomach made me not want to move, but I realized the faster I went the quicker my body could get rid of the painful gas. So, I just kept pushing through the pain and eventually it subsided and I was able to hike with a settled stomach. The view as we climbed up the side of Whitney in the early hours. You can see Guitar Lake to the right and the other lakes we passed on our way up. The morning was cold and I started the hike that morning with several layers of jackets and clothing, but after hiking for 30 minutes or so I was already taking layers off. This was a trend that reoccurred most mornings on the trail. We would start with a lot of warm layers and lose layer after layer as the hike went on and our bodies warmed up from moving around. Once my stomach felt better, the rest of the hike felt easy because at least I didn’t want to curl up in a ball on my side any more. We would take rests and water breaks and passed a lot of other friendly hikers on our way up. The sun rose fairly quickly and we realized we didn’t wake up anywhere near early enough to catch the sunrise on top of the mountain. Those early risers probably made it to see the sunrise on the mountaintop, but we were freezing even with the sun out so I was glad we didn’t start that early. Even though it was bright outside, the sun was on the other side of the mountain and our faces and hands were freezing from the elevation. The higher we got, the colder the temperature. My body had warmed up, but certain parts of me were still frozen and I wished so badly that the sun would shine down on my cold hands and face. We passed a few hikers who were on their way down whose faces were blue. When we said hello they didn’t even respond, which was the only time we met not friendly hikers on the trail. I’m pretty sure they were just freezing, but it was such an unusual occurrence for people not to smile and wave as we passed them. As we got closer to the top, the trail got rockier and more difficult. You have to be really careful – it feels like you could easily break or twist an ankle when walking on the extremely rocky parts of the trail, and I didn’t want to lose the use of my ankles or fall off the side of the mountain one bit. Looking over the edge made my stomach turn. We would pass by areas where the mountain opened up and just a little bit of sun would shine through. I would try to warm up by the sun but then we’d have to keep going ahead where there was no sun for miles. The hike up Mt. Whitney was only 4 miles but it’s a pretty tricky terrain once you get closer to the top and it didn’t feel like a short trip. We felt energized and excited the closer we got to the top of the mountain. I was thankful I didn’t have my pack on my back and excited to get to the top. I was also excited to finally get phone service so I could text my mother in law that we were safe. I had forgotten to text her when we left for the trail and there was zero phone service anywhere on the trail thus far, I knew she must be worried because we had been texting her every day on the road trip out there letting her know where we were and that we were safe. Logan told me he had heard there was phone service at the top of Mt. Whitney so I was looking forward to being able to contact her and my family, too. When we got to the top of the mountain we walked up to the emergency shelter where you can sign your name and press the “easy” button hidden inside. The climb was nothing but easy, but I pressed the button anyway and laughed. I felt so happy that we had made it to our highest peak! I lost no time finding a spot with phone service where I could sit and send messages to friends and family. Logan made fun of me for being on my phone on top of a mountain with beautiful views all around, but I was eager to ease my family’s conscience and apologize profusely to my mother in law for forgetting to text her before we left. She was thankful we were okay and only a little mad at us for forgetting to text her. 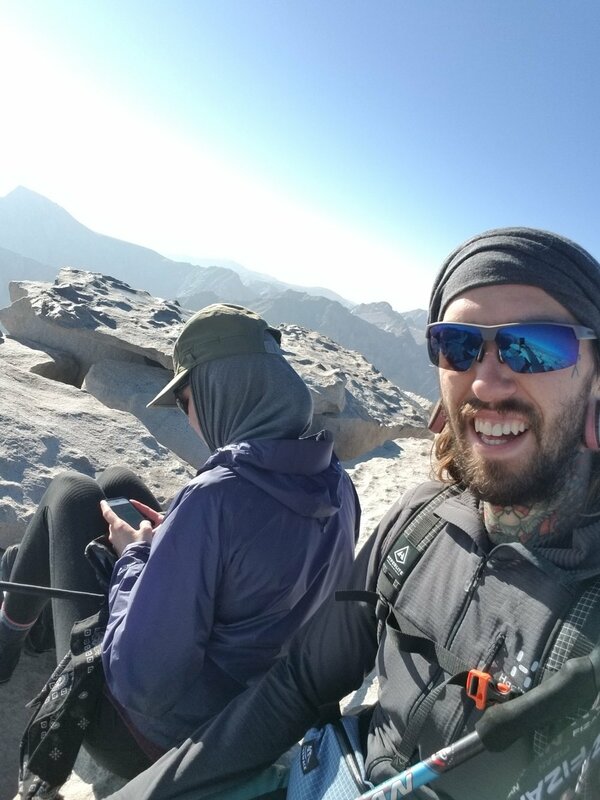 After sending all my messages, we checked out the beautiful views and got some other thru hikers to take pictures of us so we could prove we made it to the top of Whitney. We didn’t stay long. It was cold and we planned to hike at least 10 more miles that day, so we started to make our way back down the way we came. We passed lots of hikers on their way up and we encouraged them that they would make it to the top soon and warned them about tricky and slippery rocks. We had big smiles on our faces because it was sunny out and going down felt so much faster than the climb up the mountain. You can get momentum on some parts of the trail going down, but you still have to be really careful in rocky areas so you don’t trip. We passed our Canadian friends who had given us free food the day before and said our goodbyes since they were heading out towards Whitney Portal and we were going back to the trail. I didn’t tell them that their gummies had made me sick to my stomach. Later in the morning, the sun was right on top of us and it was beating down hard. Being that high up means you’re closer to the sun and it felt like we had gone from freezing and dark in the early morning to incredibly hot and bright once the sun was out. We were trying to hike as fast as we could to get down. Logan was ready to be down the mountain so he could use the bathroom. There’s no privacy on the rocky mountain and if you have to go number 2 you’re supposed to bag it and carry it down with you, which was not something Logan was eager to do. I was excited because I had been telling Logan all morning that I wanted eat powdered eggs once we got back to our camp, another food item our Canadian friends had given us the day before. I love scrambled eggs and I figured it would be a really comforting food to eat once we got back to our tent site. As soon as we got down the mountain, the sun felt like it was right on top of us and there was no wind or cool breeze to ease the heat. There were no clouds to block us from the direct sunlight either and we were still really high in elevation when we arrived back at our campsite from the night before. I have never in my life felt the sun so intensely, but I didn’t want to take my long sleeves off in fear that it would burn my already sun kissed arms and shoulders. After using the nearest facilities (just kidding there are no facilities), Logan laid down in our tent and passed out within minutes. I wanted to do the same because I was so tired from climbing a mountain and waking up so early morning, but I was sweating profusely and even inside the tent it felt unbearably hot. There was no place to hide from the sun, and my only comfort was sticking my feet in the freezing cold water of the small streams by our tent. This was worst heat we experienced on the entire trail. It almost rivaled being in Death Valley the week before during our road trip out to the trail. Once Logan woke up we made food and I was so excited to try the powdered egg. Unfortunately, it was not as I had hoped. It looked like cheese from a can but tasted like egg and that flavor and texture combo really made me queasy. Our trail magic food failed me once again. As soon as I took a bite Logan knew from my face I wouldn’t be taking another. He ate all of the so-called “egg” and then made me another meal because he’s nice like that. Logan couldn’t believe how picky I was on the trail. He assumed I’d be so hungry that I’d eat anything, but there’s just some things I won’t eat – and powdered egg is one of them. Looking back I probably wasn’t eating nearly enough due to my pickiness. I wasn’t eating enough meal bars because I was getting so sick of them. I begged Logan to make us hot meals instead, but he was worried we’d run out of fuel and food too quickly if we ate them for every meal. Once we ate and packed up our campsite, we started heading back down past all the beautiful lakes and spots we’d passed by the day before. We were running from the sun and also potential storms because weather can change so drastically on a mountain. One second it will be hot and muggy and then a cloud passes over you and you’re freezing or an intense hail or rainstorm could start out of nowhere. It rained on us a little and eventually we did end up putting on rain gear, but nothing heavy enough to write home about or to make us uncomfortable. The rain actually cooled us down and felt nice. We actually had very mild weather out on the trail compared to what a lot of other hikers had experienced. All the hikers we passed asked if we had experienced a golf ball sized hailstorm the day before but I guess we had just missed it. We were really lucky with weather and thankfully that continued for the rest of the trip. The rest of the day was really easy because it was a combination of uphill, downhill, and flat stretches. It can get really annoying going just uphill or just downhill but the combination of the two feels really nice and is easier on your body. I was also feeling super energized the second half of the day from getting food and rest after the Whitney summit. Climbing Whitney made me confident that I would be able to finish the rest of the hike. I figured it would all get easier from here on out if that was the tallest mountain we would be climbing. My back was no longer hurting, even with having to wear my pack again for the second half of the day (I’m sure my back appreciated the break!) and my feet were starting to get used to the miles. We passed by lots of friendly hikers and eventually made it to a nice flat campsite a little before Wallace Creek. It was a relaxing evening and I was thankful Logan had brought me on the trip. Our tent and the surrounding mountains were finally starting to feel like home. We woke up and packed our things fairly quickly on day five. We were getting into a routine and everything was easier and more familiar. I started the day feeling accomplished and ready to take on the next challenge. I couldn’t believe I’d hiked Mt. Whitney the day before and I was really proud of myself! I did it! The beginning of the day was easy, we went downhill and uphill back and forth for a few miles, but then the rest of the day went gradually uphill for miles and miles. At first I felt like I could do anything and pushing my body was easy. Mt. Whitney had boosted my confidence and I was convinced nothing could stop me now, but after a while I was losing steam and also losing patience with Logan. Every time I needed to stop or slow down Logan would call me a turtle, which only frustrated me. Did he not see how hard I was trying?? He only meant to jest but I was tired and thin skinned by the late afternoon. I was also probably not eating enough calories for all the miles we had been hiking. Going uphill was definitely the hardest part of the trail any day for me because I was always trying to keep up with Logan the whole time who can go a lot faster and had way better stamina. I didn’t want to feel like I was holding him back, and it frustrated me when he would comment on my pace. We talked it out and I let him know I needed his encouragement and that his jokes made me feel inadequate and upset. Being on the John Muir Trail is so dramatic. You’re seeing dramatic scenery the whole day and you’re feeling dramatic because you’re tired and hungry and in awe of the beauty around you. Dramatic is probably the best adjective for the trail, Logan and I decided, but it’s not the kind of drama that’s terribly stressful. It’s the kind of drama that keeps things interesting and makes you feel accomplished after a long day. I think Logan could have hiked the JMT in half the time if I hadn’t been there, but I know he was happy I was there with him and that he was proud of me, even though it could be frustrating to wait on me to catch up. The scenery was beautiful and we stopped fairly often just to stare at the world around us. The trail was really open and there was a new view around every corner. It was seriously so hard to take in. We kept wondering when it would sink in and feel real, but I don’t know if it ever really did. I definitely miss the views the most. It was amazing to wake up and see that kind of beauty all day. It made me feel small and extremely lucky to be there. There’s so much world out there! In the early afternoon we arrived at a group of small lakes near the base of Forester, our first pass. A pass is where you go up and over a mountain. Mt. Whitney didn’t count because we had gone up and back the way we came. We stopped to refill water and eat lunch and ran into our friend Kota and his parents who we had met the second day of the trail. It was fun to see them again and catch up. We were discouraged by a lot of other hikers to continue ahead because there was a cloud looming over to the right of Forester and storms can be dangerous when you’re climbing over a mountain. Usually people try to hike passes at the beginning of the day when you have more energy and the weather is less likely to get bad, but we accidentally kept hitting them near the end our days due to poor planning on our part. We decided to go up anyway and some hikers coming down the mountain assured us the weather was fine. We didn’t get any storms from the looming clouds, but the closer I got to the top the worse I felt. Forester was my hardest pass. Logan thinks it was because I wasn’t eating enough because I didn’t like the meal bars. He kept trying to force feed me meal bars and I could barely take bites because I hated them so much. I was being and feeling very dramatic, and the trail was being dramatically steep and difficult right back at me. We had been going uphill gradually for most of the day already, but the top of Forester took “uphill” to a whole new level. I had to stop and rest at every switchback once we neared the top. Logan was really annoyed at my pace and I was feeling desperately tired and wanting this mountain to be over. After what felt like the most grueling couple miles of my life we finally made it to the top. It was extremely sunny and windy at the top of Forester and it felt pretty scary - like if the wind hit you too hard or too suddenly it could knock you off the top of the mountain. The views were beautiful but I was too tired to enjoy them. I was mad at the mountain. I should have been mad at our poor planning with food and timing. Walking down Forester was easier in one sense because at least we weren’t climbing up so it wasn’t as tiring, but it felt like it took forever. It was so rocky so you had to go slowly and carefully and Logan and I were both exhausted from how long we took to get over the pass. After a few hours and lots of “are we there yet” moments we decided to eat dinner and rest before we got to camp because it was getting late and we didn’t want to cook after dark. We were both so hungry that we ate two meals. After dinner I changed into my thermals (which I used as PJs) since it was windy and cold and I knew I would want to go to bed as soon as we got to camp. We hiked a few more miles before arriving at a campsite just before dark. There were several other hikers eating dinner at our campsite that were hiking from the other direction and planning to hike Forester in the morning. I wanted to hang out and make friends but I was too exhausted. We set up camp and felt elated to be done with the day and go to bed. I was so happy to see my sleeping bag and my tent. It felt like home. 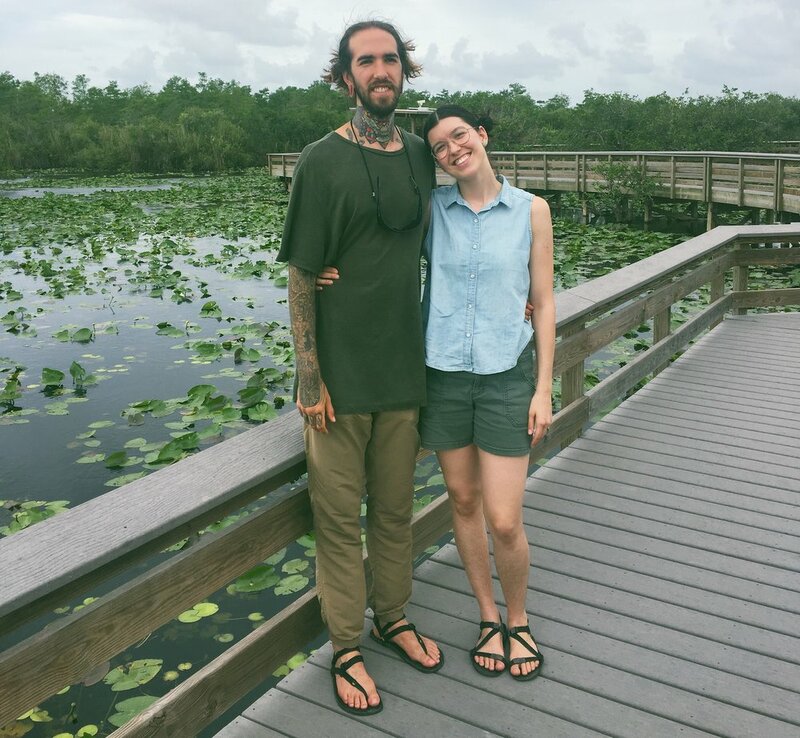 We woke up at Chicken Spring Lake on Tuesday and ate our meal bars for breakfast. Logan planned the food for the trip and thought we would be okay just having meal bars for breakfast and lunch and then one hot meal for dinner. The meal bars were my biggest regret of this whole trip! I feel sick just thinking about them. It’s not that they tasted terrible. They actually tasted good for the first few bars! But to eat 2 meal bars for breakfast and another 2 for lunch every day is enough to drive anyone insane. I was always just thinking about dinner, which was our one hot meal for the day. I’m definitely packing different food for the next trip and way more variety so I don’t get sick of our food. Honestly most of our days on the trail were spent talking about food we wish we could be eating and brainstorming what food we’d bring on our next hike. Logan by a PCT trail marker! After breakfast, we packed our tent, headed to the lake to filter some water, and then started back on the trail! The beginning of the day was easy and we made our first trail friend, Kota! He was hiking the trail with his parents (who were in their seventies!) but he was a little further ahead of them so he walked with us for a couple miles and we were able to hang out and talk while still hiking the trail. We actually saw a lot of older people, like Kota’s parents, on the trail who were killing it and I was super impressed by all of them – I think a lot of them were way better at hiking than me, too (especially at the beginning)! And everyone we met on the trail was super friendly! Honestly meeting all the friendly hikers and making new friends was the best part of the trip. You never meet a stranger on the trail! We met another woman later that day who was also older and hiking by herself. We talked with her while we were filtering more water by a stream and I soaked my already sore, tired feet in the freezing water. We also got to see Kota again who we had lost track of earlier that day. He caught up to us and was setting up camp while we were still filtering water. Filtering water seemed to take forever, but I enjoyed the break. As we said goodbye to Kota, we told him how much further we were going that day and he seemed a little surprised. I was feeling motivated and confident at this point so Kota’s reaction didn’t faze me. I put my faith in Logan that he wouldn’t push us too hard on the second day since the first was such a breeze, but as the day went on I started to lose faith. Feeling confident early on in day 2! This day was one of the hardest days for me. After saying farewell to our new friends, the day seemed to drag on and on. Logan was trying to get us all the way to the bottom of Whitney so we could hike it the following morning but that meant hiking over 15 miles, which wasn’t a distance I was used to yet. My feet were hurting and I was already starting to get blisters. My lower back was in a lot of pain, too, and I ended up putting my ThermaRest Z-seat in between my back and my pack to help ease the pressure. I kept rearranging my pack straps with all the buckles and pulls over and over hoping to find the right position that would ease my pain. I worried I hadn’t arranged the contents inside my pack correctly too and that I had uneven weight distribution. I was mostly just upset I was hurting and trying to fix it desperately because I knew we had so many more miles to hike that day (and the days after). Looking back I’m sure repositioning helped some, but there was probably not much I could have done to ease my aches. It was the beginning of the trail breaking in my body (and my mind) to be able to handle the journey ahead, and I wasn’t enjoying it at all. Logan was also not feeling well because he started getting elevation sickness (thankfully I didn’t get it because I don’t think I could have handled it that day), but even so I’m pretty sure the most difficult thing for him was listening to the sound of my whining increasing with each mile. My feet were mad, my back was hurting, and I wanted to blame someone. I kept telling Logan he should have eased us into the hike more instead of doing 15 miles the second day and also said a lot of other things Logan probably remembers better than I do. I was going really slow (that’s what Logan tells me) and we were both in bad moods (me from the hike and Logan from dealing with me on the hike). I kept telling myself it would be over soon, but then I would look ahead to see we were nowhere close to being done and not want to take another step. At the end of the day we were mostly silent and sullen (trying to avoid arguing) and Logan wasn’t sure how much further he should push me. It didn’t seem like we would make it as far as we originally planned since we were going so slow and it would be dark soon. After a few scuffles about where to set up camp, we settled a mile or so before we had intended and I tended to my hurting feet while Logan went to get some water by a nearby stream. By the time we finished setting up camp and filtering water it was dark and that meant cooking dinner by lamplight. I was feeling exhausted, cold, and desperate for a hot meal. I sat on a rock in my thermals and used my headlamp to shine light while Logan cooked. He told me I had to be the lookout for bears and other animals since he was cooking in the dark so I was frantically trying to listen and peer into the dark all the while imagining what I would do if a wild animal really did show up. The first few days of the hike I was pretty scared of the possibility of bears, snakes, and other dangerous wild animals. This fear dissipated over time, but this night I was still fully afraid and not okay with being in shared space with wildlife. I knew the smells of our food and the fact that it was night only increased our chances of an encounter, but thankfully no animals showed up to join us for dinner. I was taking forever going up these switchbacks which gave Logan a lot of time to take pictures of me on my way up. Finally, our meal was done! I was so excited. Food was my only solace after this long day and I couldn’t wait to eat – which is why it was devastating when Logan took the first bite and realized he had made a mistake. He had made a prepackaged camping meal - Good To-Go’s Korean Bibimbap - that we had never tried before and it was way too spicy. If you know me, you know that I can’t handle spicy food at all, and so Logan had to eat the whole thing so he could use our pot to make me another meal. Even Logan had a hard time with how spicy it was! While he ate and cooked another meal for me, I finished off our bag of kettle chips (the only salty snack left) and watched for bears in the dark. He made me a delicious chickpea concoction that was thankfully not spicy, but I could have eaten twice the amount he made me given the opportunity. After dinner and clean up we were both exhausted and fell asleep quickly in our tent hoping for a better tomorrow. We slept in and had a slow morning on day three. We were still trying to recover from the day before and were not in any rush to get started. We had stayed in a meadow the night before so everything was damp and we were trying to give our things time to dry out in the sun before we packed them up. We ate our meal bars, brushed our teeth, and enjoyed the views from our site that we didn’t get to see the night before. I was bandaging up my feet with band aids and duct tape hoping it would help my toes survive another day. 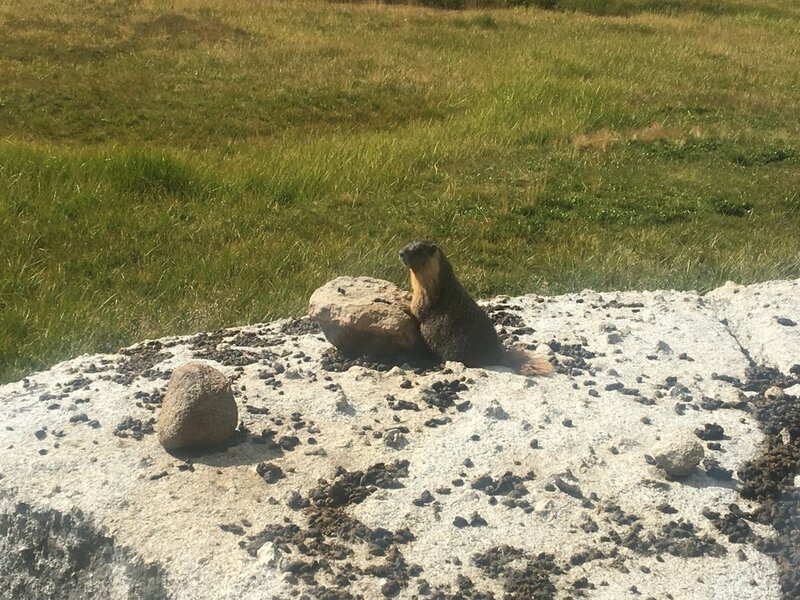 There were a few marmots laying out in the sun on rocks near our campsite that morning so we took lots of pictures of them and hoped they didn’t have the guts to try to steal our breakfast. The view from our campsite and one of our marmot friends! Once everything was packed up, I was ready for a new day and hoping to redeem myself from the day before. We were trying to get to Whitney and I was nervous and excited to meet the biggest mountain in the US. The morning was easy and we didn’t have a ton of elevation to climb at the beginning of the day. The beautiful scenery around me lifted my spirits and reminded me why people thru hike in the first place. One of our first scenic stops was Timberline Lake and we stopped to take pictures and enjoy the water. We passed lots of friendly thru hikers heading southbound and enjoyed our passing conversations with them. Many of the hikers discouraged us from hiking Whitney that day. They told us the weather could be dangerous on the mountain in the afternoon, which is when we would be getting to the mountain. I was feeling really energized and not wanting to give up, and both Logan and I were set on trying to hike Whitney that day so we wouldn’t get off schedule. We started going uphill for a good stint and met a ranger on her way down. She didn’t think climbing Whitney in the afternoon would be a problem so we felt encouraged and kept on our way. It didn’t take long for us to get to Guitar Lake where there were a lot of campers and sites set up. They were most likely posted there and planned on climbing the mountain in the morning. We went a little further up past Guitar Lake and spent some time relaxing and getting water in a less crowded area. It was so beautiful and I really enjoyed relaxing by the clear, pristine water. I took my shoes off and let my feet and socks air out and rested on the grass. The air was cool but the sun was shining and it felt amazing. I was really enjoying this day and felt confident we would still be able to scale Whitney. Looking out over Guitar Lake and then relaxing at a smaller lake a few miles closer to Whitney. After our break, we packed up our things and left our beautiful resting place for higher ground. We passed a few older women coming down from Whitney and asked them for their advice before heading up the mountain. They told us it took them 6 hours to get up and back down which made us reconsider our plans since it was already 2pm. Even if we did it faster than them it would still be a late day, plus they warned us again about the potential for dangerous weather. I didn’t want to give up, but it seemed like we weren’t going to be able to climb Whitney that day like we’d hoped. We decided if weren’t going to scale the mountain that day we would at least get as close as possible. We kept hiking until we found a spot right at the base of Whitney to set up camp. It rained a little for the last bit of our climb and we passed some Canadian hikers who were getting on their rain jackets and headed the same way as us. They arrived to the campsite right after us and set up camp on higher ground. As we started to set up camp it immediately started hailing and we were frantically trying to get our tent set up so we could get inside. The ground wouldn’t hold our stakes very well so they kept coming up out of the ground and we kept having to run around and re-stake the ones that had come back up into the ground again. We eventually started putting big rocks on top of them so they wouldn’t come up and were able to get ourselves into our tent and out of the hail. The hail didn’t last long and we were able to spend the rest of our day relaxing at our campsite in perfect weather. Our tent at the base of Whitney. After the storm passed, one of the Canadian campers came down to our site and offered us free food! They were going over the mountain and finishing their trip and had a ton of leftover camping meals they didn’t want to carry. This kind of thing (getting free stuff on the trail) is called trail magic and it really was magical because we were so tired of eating meal bars (especially me!). We thanked our new Canadian friend, Bob, and his fellow campers and I convinced Logan to cook us 2 meals instead of 1 for dinner because now we had extra hot meals and I was so hungry! They also gave us energy gummies that tasted like candy and I ate several right away. My stomach was a little upset the rest of the day but I figured it was just from so much food it wasn’t used to. I was so excited about all the new food we had and enjoyed our unexpected easy day. The sunset at the base of the mountain was beautiful. We went to bed early because we were waking up at four in the morning to start the climb and we wanted to try to see the sunrise at the top of Mt. Whitney if we could. My name is Jillian. I’m a thru hiker! And also a musician, as you can probably tell from this band website where you’re reading this blog (Check out my music! It’s great, I promise!). 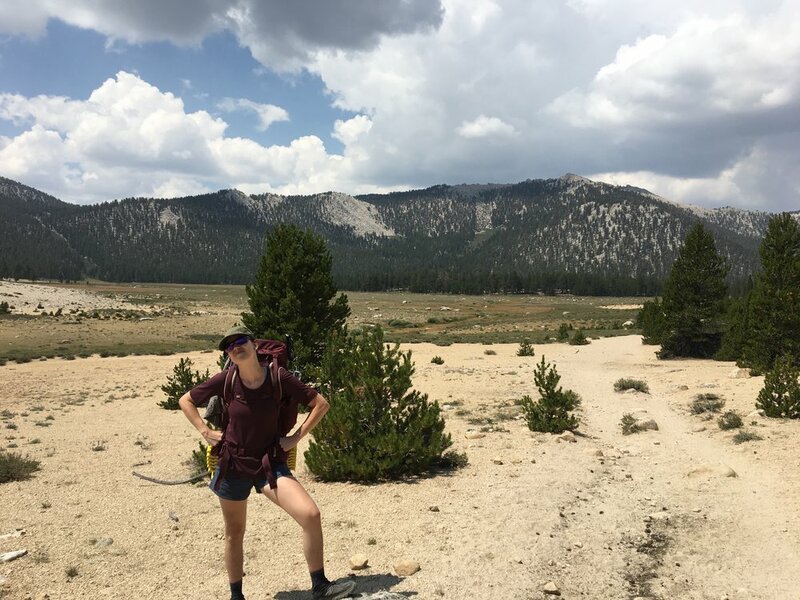 For the first 27 years of my life I never thought of myself as athletic or the ‘”outdoorsy type” (even though I had always secretly wished to be) but after hiking the John Muir Trail this August I honestly feel like I can do anything and be anything I put my mind to. I’m going to do my best to remember and write about our trip here and go through the journey a couple days at a time. The JMT was originally my husband (and band mate) Logan’s dream that I opted onto out of support. I also wanted to do it to push myself in new ways. Plus, I knew I would miss him if he went without me. He joined my band The Mailboxes to support my dream and so I wanted to support his dreams by doing this with him. I never would have done anything like this if it weren’t for Logan, but I’m so glad I did! Logan watched the documentary “Mile, Mile and a Half” a few years ago, which is what sparked his interest in the hike. 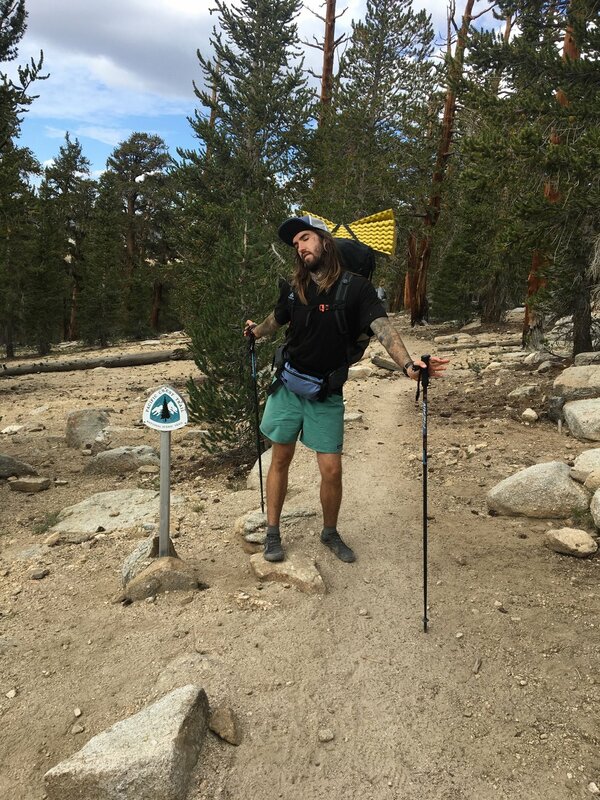 Ever since then, it has been his goal to hike the JMT before thirty. Our JMT plans were finally set into motion last year after Logan broke his right wrist and left elbow in a crazy and serious accident. The accident made him want to do the hike even more and to do it as soon as possible before he broke any other body parts. We started prepping and buying a ton of outdoor gear, which is really fun (especially if you get an REI membership because you can try things and return them if they don’t work out!). We consider going to REI our version of a “date night” now. To hike the JMT you need a permit and you have to apply for a lottery because so many people want to hike it each year. We had to apply several times, but eventually we got a permit to hike southbound (SOBO) starting August 14th from Yosemite to Mt. Whitney. Most people who apply for a permit get denied and SOBO JMT permits are in high demand, so we were so excited when we finally got ours! Logan and I stopped at the Grand Canyon on our road trip out to the trail! There was a lot of smoke there from surrounding fires, but the views were still breathtaking. Logan meticulously planned the trip for us (much like I do for our tours) and he was the one doing pretty much all the work and research to prepare. In my head, this was HIS thing and I was just here for the ride (and the cool gear and outdoor clothing). As the hike got closer we got more and more excited (and Logan got more and more ultra light gear because he was afraid of me not being able to enjoy the trip while carrying a super heavy pack. I think he wanted to lighten his own load, too). We planned to drive out to California starting August 8th and take a scenic 5-day road trip out to Yosemite through other national parks and cities we wanted to explore. Much to our dismay, a few days before we were supposed to leave on our road trip to CA we started hearing about the Ferguson Fires, which closed Yosemite and made us worry that our trip would be cancelled. Even though the fires hadn’t stopped by our departure date we still decided to start the drive to California all the way from Tennessee in hopes that the fires would die down over the next week and that we would still be able to use our permit to go SOBO. If that failed, our plan was to try and get a NOBO permit starting at Whitney as soon as we could. 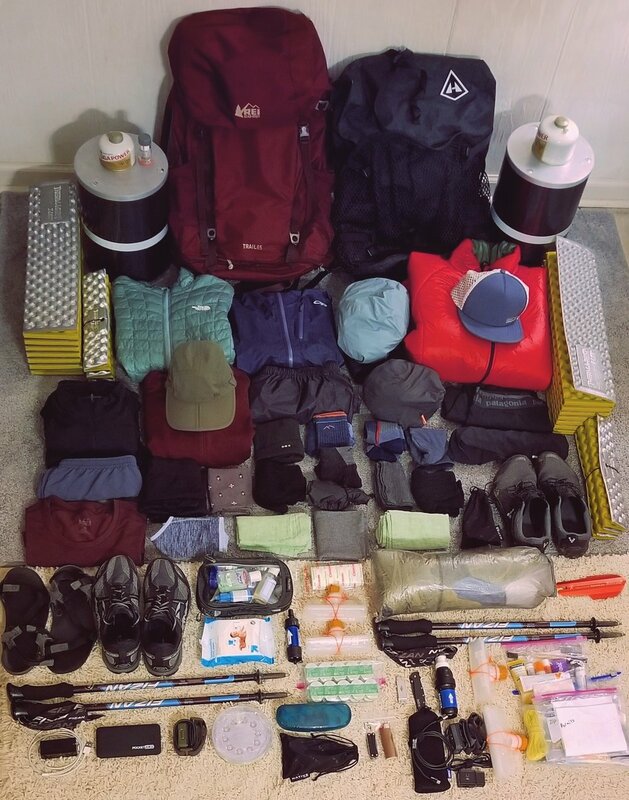 A picture of all our gear for the trail! As we got closer to California, it seemed like we would still be able to use our original permit since Yosemite was opening on our start date, but then we got an email saying our permit for Glacier Point was null because firefighters and responders were still posted there and that we would have to “reschedule” our trip. In other words “try again next year.” Still hopeful (and also a little nervous), we drove to Lone Pine on Sunday the 12th (Logan’s 29th birthday by the way!) and hoped to get a NOBO permit as soon as we could. We woke up super early and got in line with the other hikers and got a NOBO permit right away! We couldn’t believe how easy it was compared to the hassle of getting our SOBO permit earlier this year. 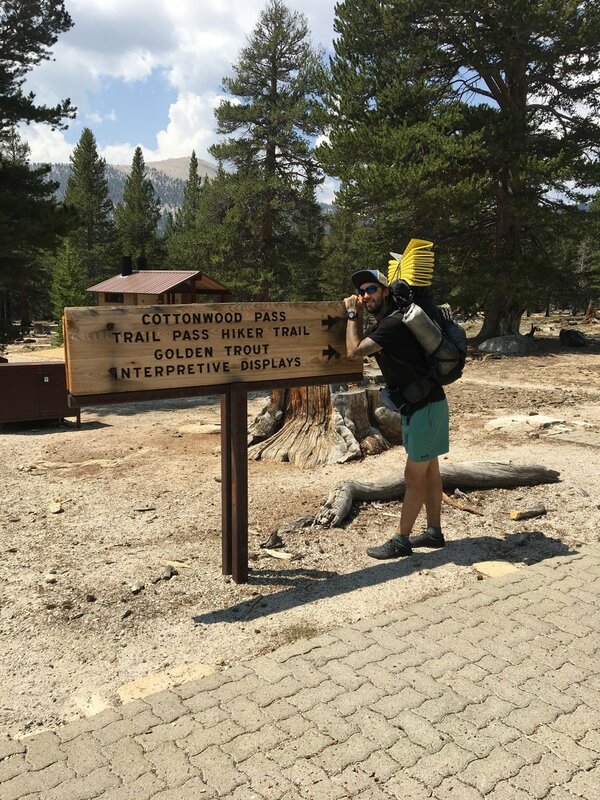 We got a permit to start at Cottonwood Pass instead of Whitney Portal because Logan figured it would be a less popular permit and therefore easier to acquire (and it really was so easy!). 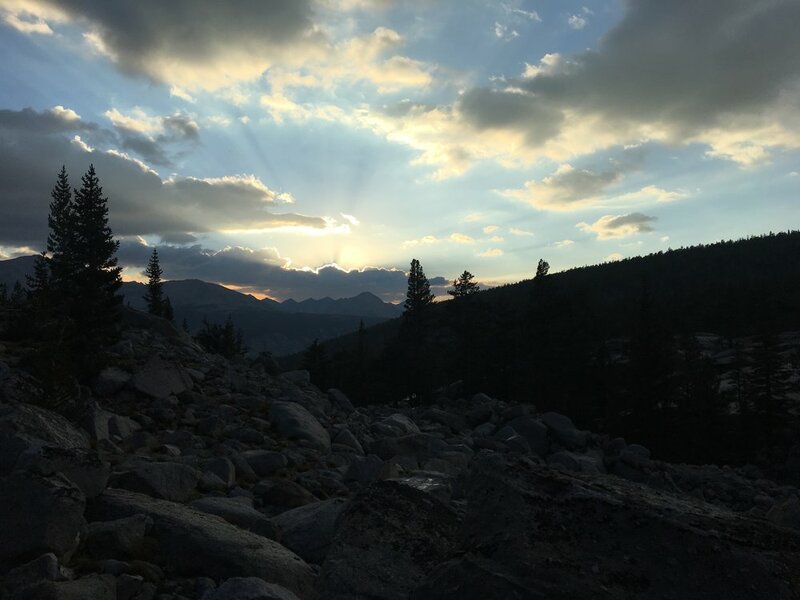 That meant, however, that the first 20 miles of our hike we weren’t even going to be technically on the JMT, but rather the PCT and then we would meet up with the JMT at Crabtree Meadow in a couple days. I’m somewhat thankful for the extra miles, however, because it gave us a chance warm up and get our hiking legs ready before hitting the biggest mountain in the contiguous US, Mt. Whitney, and all the passes to come. After we got our permit, we went to breakfast at Alabama Hills Café in Lone Pine for one last big meal before the trail and then headed up in our car to the Cottonwood Pass trailhead. As soon as we started driving up the mountain we lost phone service, which was only upsetting because I had forgotten to text Logan’s mom that we had gotten our permit and were starting a day early! (Sorry Wendy! She was really worried because we didn’t gain service until Thursday and had no idea what had happened to us!) After the 45 minute drive to the trailhead, we locked up our car, got our packs on, and started on the trail – it felt surreal. I had no idea what I was getting myself into! I’d never done anything like this – neither had Logan. All I knew was that this would be my life for the next 18 or so days. The first day was easy looking back – although Logan will tell you I immediately started whining and questioning everything as soon as we started going uphill for a good stretch. We only hiked 4.5 miles that day because Logan was worried about me getting elevation sickness and wanted to give us a chance to acclimate to the higher elevation. We ended the day fairly early at our campsite at Chicken Spring Lake, which was beautiful and (again) surreal. The whole walk up to the campsite was beautiful, too. Heck I saw so much beauty I don’t think I could really take it all in. The scenery was so different from what we were used to in the Tennessee mountains and everything felt so open and dramatic. Once we arrived at Chicken Spring Lake we set up camp and hung out on our sleeping pads down by the lake where it was cool and sunny. There were some other campers there who were mule supported, which means they had mules carry out a lot of their gear to the site. You have to walk over a lot of mule poop on the trail. This fun element lasted pretty much the entire trip and is something they don’t mention in the brochures. We passed by some real life cowboys several times who were guiding the mules to the different sites. After setting up camp, Logan and I relaxed the rest of the day and played a card game with a deck of cards we bought at the Grand Canyon on our road trip the week before (it was the only time we used that deck of cards on the whole trip by the way). It was by far the easiest most relaxing day we had the whole trip and I was feeling really excited for what was to come. Early in the first day we mostly walked through sand!